Yemen's Houthis -- America's New Proxies? President Obama is in danger of making the same kind of mistake that President Jimmy Carter made on the eve of the Iranian revolution. President Carter, indulgent in his belief in the strength of the Shah of Iran and in his refusal to confront the emergent reality that Iran, once the American bulwark against Soviet expansion, was faced with a revolution, failed to make meaningful contacts to the leader of those who opposed Shah Mohammad Reza Pahlavi. That leader was Ayatollah Ruhollah Khomeini who was living in exile in Paris at the time and, as we all know, events outpaced Jimmy Carter's convictions. President Obama should take decisive action now to develop the framework to provide aid and assistance to the Houthis who now control Yemen's capital Sana'a and other geographical locales. Instead of working to compel Secretary of State John Kerry to make more overt moves to engage the Houthi's chieftain, Hussein Badreddin al-Houthi and help him in his fierce struggle against al-Qaeda in the Arabian Peninsula (AQAP), the Obama administration, as do the Saudis, runs the risk of losing even more control of events in Yemen by supporting President Abd Rabbuh Mansour Hadi, whose underlying capacity to lead Yemen was at least debatable until his resignation today. Even though the Houthis had claimed that their occupation of Sana'a did not amount to the ouster of the Hadi regime, the writing on the wall seemed clear. As if that were not enough of a problem, the Iranians provide assistance to the Houthis precisely because the Houthis are Zaydis, who are a minority group of Shia Muslims that trace their origins to Imam Zayid who died in 740 A.D. In effect, the Houthis nowadays serve as an Iranian "proxy group" or "surrogate" because of those religious affinities and because they have been opposed to the regime of President Hadi, who was supported by the Saudis in their own proxy struggle with Iran. It is commonplace to note the sources and origins of the Houthis paramilitary as a political force revolving around demands and aspirations for increased Zaydi inclusion in Yemeni society over and beyond where they are primarily found in Northern Yemen. Since their march on Sana'a those Houthi activists, under their leader, Abdel Malek al-Houthi, have essentially served as an ad hoc parallel government in opposition to the government of President Hadi. Now, what's to come is difficult to appraise. The Obama administration had better rank its national security interests and rank them quickly. It has been reported that instead of withering under the assaults of the Hadi regime, al-Qaeda in the Arabian Peninsula has actually strengthened its resolve, if not its overall strength, in its fierce struggle to control areas of Yemen, and presumably, the entire country if given that opportunity. It is also generally recognized among experts cited that al Qaeda in the Arabian Peninsula (AQAP) is best able to mount international terrorist attacks that target the West. What is even more foreboding, is the seeming ability of al Qaeda and the Islamic State (IS) to inspire a multitude of "lone-wolf" and small groups of terrorists through propaganda messages primarily disseminated through the mosque and Internet as venues. This type of online message-making was essentially pioneered by American born Shaykh Anwar al-Awlaki, the late al Qaeda in the Arabian Peninsula chieftain, who himself was the son of Yemeni parents, and born and raised in New Mexico. The catastrophic events in Paris last week and the probable linkages of at least one of the Kouachi brothers to AQAP only serves to underscore the threat that AQAP continues to pose at several levels. In addition, both al-Awlaki and the Kouachi brothers, as well as the Tsarnaev brothers of Boston were the sons of one or more immigrant parents, and that reality, coupled with several other instances of "second generation" youth fighting in the name of Islamic radicalism underscores the potential for violence that some "second generation" citizens in the West pose when they are marginalized politically, culturally, or economically. To address those problems, the Obama administration has reportedly set up radicalization prevention pilot programs in Boston, Los Angeles, and Minneapolis, but what is crucial here is twofold: those "softer-line" counter-terror programs should include acculturation and educational efforts that dovetail well to "hard-line" strategies primarily carried out in foreign countries. One key component of counter-terror strategies that rely on a mix of "hard-line" and "softer-line" efforts, that themselves involve potential terrorist organization constituent groups, must be centered in Yemen. There are four important reasons why now is the time for the Obama administration to "strike while the iron is hot" and commit to supporting the Houthis and their constituents. First, is the threat of al Qaeda in the Arabian Peninsula. There have been recent reports of possible efforts to create closer relationships between the Islamic State (IS) and the Taliban in Afghanistan, and that coupled with the prospect of even greater coordination and rivalry between the Islamic State (IS) and al Qaeda in the Arabian Peninsula, must be considered as possible scenarios in any strategic analysis. As a colleague of mine at Walsh College and I discussed, perhaps one of the most predominant legacies of the Islamic State (IS) is its sustained assault against the "artificial borders" set up by the imperialist powers that have traditionally worked to rend apart the Middle East. For example, we know that such an "artificial border" between Syria and Iraq has for all effects and purposes, ceased to exist. If this is the beginning of a trend, such alliances between terrorist groups becomes much easier to accomplish with the weakening of traditional states in the Middle East. Second, the collapse of oil prices and its effects on oil producing countries such as Iran makes it much more difficult for Iran to maintain the type of support a group like the Houthi paramilitary (or terrorist groups such as Hamas or Hezbollah for that matter) needs to continue operations in the long-haul. Why not step in and replace the Iranians with the type of sustained and deeper assistance that can establish the type of alliance we need in the region? It also does not hurt to establish such an alliance if our goal in the long-haul is to somehow improve the United States-Iran relationship. "International politics makes strange bedfellows" and indeed such policy might supplement the Obama administration's stated mission to improve ties with Iran by means of an international agreement about its nuclear program. 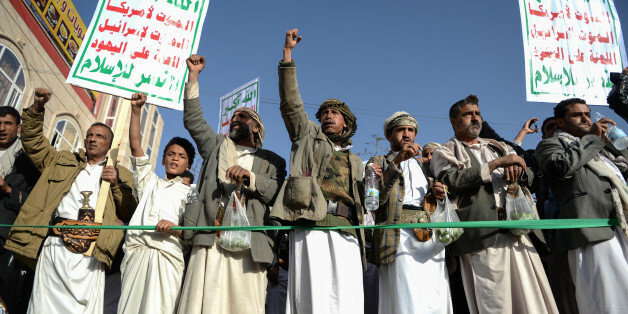 The shrill and harsh rhetoric the Houthis are known for with respect to Israel and the United States is an example of the type of extremist language often spoken by those on the political margins or outskirts, and once the challenges of responsible government management present themselves, those Houthi narratives might become less pronounced. Third, even though the Saudis would presumably object, now is the time for President Obama to push this new initiative, precisely because with the death of King Abdullah and the fledgling regime of King Salman bin Abdulaziz al Saud, Saudi Arabian policymakers are in no position now to object strenuously presumably because of their present internal focus and Saudi Arabia's own economic concerns (and OPEC's) as oil prices continue to tumble in part because American companies continue to extract energy resources from shale drilling production. The Saudis should realize that Islamic radicalism, rather than Iran is the more immediate threat, especially if the contemporary American-Iranian relationship begins to mature. Fourth, is the geopolitical and strategic threat China poses to the world. China is the world's leading oil consumer and like the United States, that is the world's second largest oil consumer, the enormous drop in oil prices empowers the Chinese. As a result, China will be able to supply its clients or potential clients around the world in places like Africa and the Middle East with more economic, political, and military clout as it is able to benefit from this global market low in oil prices with increased production of goods, services, and investment income. Iran and China share a set of economic, military, and political relationships and it is plausible that if the United States does not step into support the Houthis now, the Chinese will do so directly or by means of Iran in order to expand their toehold in the Middle East. Seen from a slightly different angle, an even stronger set of Chinese-Iranian connections with Yemen as its locus is not in American strategic interests. The scope and breadth of Islamic radicalism continues to grow apace; it is incumbent on the Obama administration to act now in tactical and strategic terms to try to shore up, as best it can, American influence in Yemen. Could it be that Sana'a is the new Tehran for Barack Obama? Possibly, but the stakes are too high to do otherwise but act, for inaction in Yemen would engage in the same type of vacillation in Middle East policy that was the hallmark of the Carter presidency. The author's views are his alone and do not reflect the views of Walsh College.